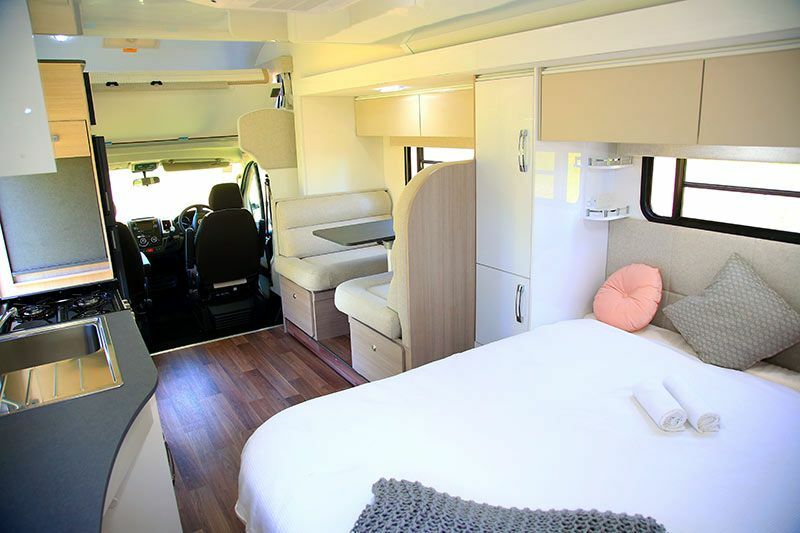 Based on the Fiat Ducato, the four-berth Avida Birdsville has been updated for 2019. Avida has released its Birdsville motorhome with 2019 updates and we wasted no time climbing aboard for a test drive. It’s large, spacious and – perhaps best of all – it can be driven on a standard car licence. Based on the Fiat Ducato, which is among the most popular motorhome conversion vehicles in Australia, the MY19 Avida Birdsville sports an offside slide-out, fibreglass sandwich panel construction, a new nose cone above the driver’s cab, new rear mouldings, new louvre windows with roller blinds, a new four-point security entry door, a reverse camera, new decal design and a completely new interior. We climbed aboard the C class Birdsville just out of Melbourne and took it for a run along some freeways, up a couple of hills and along some secondary roads. The Ducato, with its four-cylinder turbodiesel engine, which puts out up to 400Nm of torque and 130kW of power, certainly proved capable on all fronts. Given the Tare weight of 3616kg, I expected the motorhome to be a little more ‘sluggish’ than it actually was, especially when ascending hills. Yes, there’s the expected turbo lag, but it didn’t hamper my driving experience. Externally, the Avida Birdsville is fitted out with two nearside storage lockers, a fold-down picnic table, a reversing camera, a roll-out awning, an offside locker dedicated to the dual 4kg gas cylinders, and another offside storage locker. Now, both the offside lockers are a little awkward to access when the slide-out is open – you’ll need to get on your hands and knees. I don’t intend this as a criticism; in fact, it’s quite common amongst slide-out-fitted motorhomes. But it’s something to be aware of. One aspect of the offside that I love, however, is the fact you can access the storage area underneath both internal dinette lounges via individual hatches in the slide-out. The Birdsville comes with a 124L fresh water storage tank and a matching 124L grey water tank, which should keep you going for a few days or a week off the grid. One 100Ah deep-cycle battery with a 16A charger is supplied standard, too. Entering the Avida Birdsville via the electric step, I thought the interior was all class. It’s characterised by acres of storage, a few clever solutions to common layout problems, and a pleasing fit and finish throughout, including the intuitive electronic control panel in a cabinet above the entry door. Now, this motorhome is also available as a B class unit (i.e., without the Luton peak) but when it comes to cab-chassis motorhomes, I prefer the C class units. 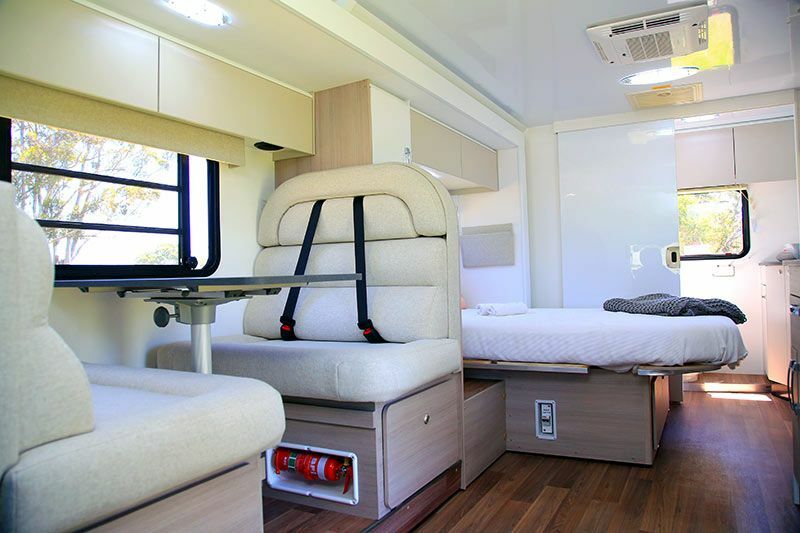 Yes, the Luton peak inevitably adds to the overall height, but the over-cab bed is handy, especially if you’d prefer to use it as a storage compartment – Avida even provides a cargo net that secures tightly into place. Access to and from the driver’s cab is unimpeded, and the cafe-style dinette is good and comfortable. The rearmost seat is fitted with seatbelts, including child restraints, so the motorhome can legally carry four passengers. There are no reading lights here, but there are a couple of speakers mounted above (there’s a radio in the driver’s cab as well as in the living quarters), and a good spread of overhead storage, not to mention the easily-accessible aforementioned storage under the seats. I, for one, really liked the nearside kitchen. Aside from its neat, clean appearance, a piece of bench can be folded down across the entryway, adding to the bench space and even acting as a kind of ‘bar’ for outdoor guests. One small criticism: the sliding bolt lock that holds it closed against the wall was a very tight fit, making it difficult to deploy and re-secure this bench. At the foot of the bed is an impressive array of cabinetry and yet another bench, while a 22in TV is stored on a swivel arm in a locker above so it can be viewed from either the bed or the dinette. Only one wardrobe is provided – between the bed and dinette – but it’s very large. Besides, given the amount of other storage options throughout, I don’t view this as an issue. The bathroom is a highlight of this motorhome. Stretching across the full width of the Avida Birdsville, at the rear, it contains an offside shower, a central cassette toilet, and an offside vanity unit with a porcelain sink. The vanity is particularly neatly presented but storage space below is somewhat impeded by the supplied hot water service. Again, I don’t intend this as a criticism – the HWS has to go somewhere, after all. The vanity also houses the optional top-loader washing machine beneath the bench. For privacy, the bathroom is separated from the main living quarters by a solid door. A general observation: for quick stops for lunch or coffee, the main functions of the Birdsville can still be used when the slide-out is closed. The kitchen remains easily accessible, and that includes the three-way fridge and the microwave that sits between the entrance and the Luton peak. Among the other features, the Birdsville gets a Dometic reverse-cycle air-conditioner, 12V and 240V and USB points throughout, a four-burner cooktop and griller in the kitchen and, adding to the overall visual appeal, are handle-free overhead lockers. The drawers have a soft-close function, too. In all honesty, there was very little that I didn’t like about the interior of this motorhome. It’s smart. It’s stylish. And the layout is logical, with very few compromises. Cab-chassis motorhomes typically offer a decent payload capacity, and the Avida Birdsville is no different. With its Gross Vehicle Mass of 4400kg, you can load the motorhome up with 784kg worth of water, gas, people, food and gear, though you’d have to expect the Ducato to be a little slower ascending steep hills when loaded to the hilt. The MY19 C class Avida Birdsville appears to be a well-specced motorhome for its price point. It’s also well finished off, inside and out, with a choice of interior colours and external decals. It should happily suit up to four people for long hauls around the country.